Meets at 7.30pm on the third Tuesday of the month (except January), usually at Pomonal Hall, Pomonal. Membership fees: Single $4 Family $5 + Australian Plants Society Victoria membership fees. 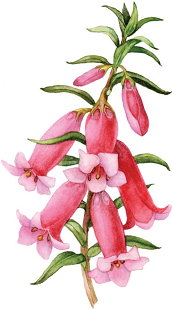 After 36 consecutive years of presenting the much admired and iconic Pomonal Native Flower Show, visitors might expect the Australian Plants Society Grampians Group to have run out of ideas, but at the 37th show on the 5th and 6th of October 2019 at the Pomonal Hall, the theme will be Native Gardens for Wildlife. Commencing on Saturday the 5th from 9.00 until 5.00 and on Sunday the 6th from 9.00 until 4.00, visitors will be able to see a fabulous display of hundreds of named native flower species and all of these picked from members’ gardens. Visitors will also be able to buy loads of native plants (many which are rare and collectable), gardening and botany books and also refreshments; and they were able to visit some excellent local native gardens, included in the price of flower show entry ticket. Throughout the display will be information on attracting wildlife to your garden, identifying key plant genera and species. A beautiful show for a very low entry fee (children free). Visitors can take the opportunity to visit the grand, picturesque and botanically-significant Grampians National Park on the same weekend. Please email Jocelyn King, or the Grampians Group, or call 0414 933 603 for show enquiries and visit easterngrampians.com.au or ring the Halls Gap and Grampians Visitor Information Centre on 1800 065 599 for general enquiries. You can also follow us on Facebook at APS Grampians Group. This event has been supported by the Ararat Rural City Council.